Visualize the red four-petalled lotus Muladhara chakra with the red Seli plasma superimposed over it at your root. 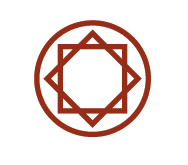 Hold this visualization and feel the two intermingle as you chant the sacred letter HRAM as long as your breath can sustain it. Locate Heptad Gate 291 and the Alpha-Beta symbol on the 441 holomind perceiver. Its matrix location is V11:H5, fifth circuit, 7th time dimension, vertical time cosmic command descending. Now locate it in your body at the middle back of your skull, halfway between base and crown. Visualize the Alpha-Beta hyperplasma above the red Seli in your root chakra. Take the Alpha-Beta into the second mental sphere in the third time dimension (cosmic synchronization) where it activates the subconscious as informative Samadhi. Here is the intergalactic channel (BMU 351) through which the Alpha-Beta hyperplasma is secreted into the front, right hemisphere of the brain. 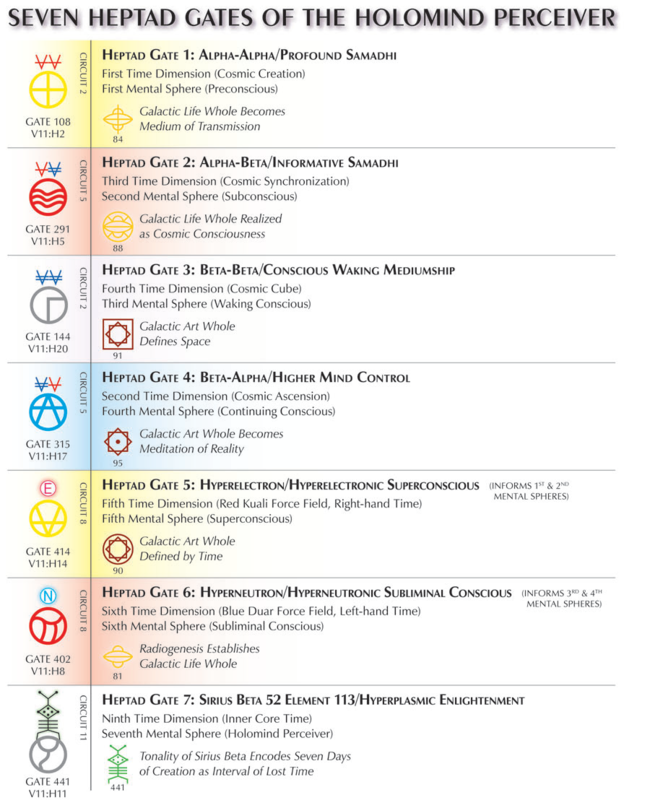 From the second mental sphere, mentally direct the Alpha-Beta hyperplasma to the root chakra and impress it above the Seli seal. Hold this with four alternate nostril breaths (four times in and out through each nostril), followed by one breath through both nostrils. Ascend up the central column (spine), secreting this Alpha-Beta hyperplasma into all 144,000 etheric fibers of the astral body. Practice the breath of fire, rapid shallow breathing through the nose, transmuting any blockages or obscurations into streams of crystal clear informative Samadhi spreading throughout your entire nervous system. 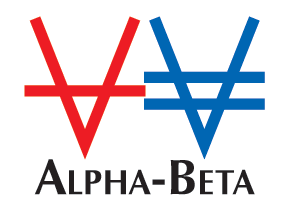 Spectral, electric red and blue Alpha-Beta vibrates subtle activating force into all etheric fibers. Descend back down central channel and leave Seli at the root chakra. Ascend back up central channel and return your consciousness to the second mental sphere, then close and seal the Heptad Gate at the middle of the back of your skull. Relax and breathe slowly and deeply at least 13 times. Harmonic UR rune 88: Galactic Life Whole Realized as Cosmic Consciousness. For additional practice: Locate Heptad Gate 291 on the Hunab Ku 21. 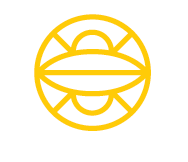 Note that it corresponds to the Avatar, Accomplisher of Knowledge, the Exemplar; G/K Earth, Bode Number 10. Visualize the orange six-petalled lotus Svadhisthana chakra with the blue Kali plasma superimposed over it at your sacral area. Hold this visualization and feel the two intermingle as you chant the sacred letter HRIM as long as your breath can sustain it. 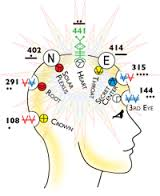 Locate Heptad Gate 315 and the Beta-Alpha symbol on the 441 holomind perceiver. Its matrix location is V11:H17, fifth circuit, 8th time dimension, vertical time cosmic command ascending. Now locate it in your body at the top of your forehead, just above the third eye. Visualize the Beta-Alpha hyperplasma above the blue Kali in your secret center chakra. Take the Beta-Alpha into the fourth mental sphere in the second time dimension (cosmic ascension) where it activates continuing conscious as higher mind control. Here is the intergalactic channel (BMU 331) through which the Beta-Alpha hyperplasma is secreted into the rear left hemisphere of the brain. From the fourth mental sphere, mentally direct the Beta-Alpha hyperplasma to the secret center chakra and impress it above the Kali seal. Hold this with four alternate nostril breaths (four times in and out through each nostril), followed by one breath through both nostrils. Ascend up the central column (spine), secreting this Beta-Alpha hyperplasma into all 144,000 etheric fibers of the astral body. Practice the breath of fire, rapid shallow breathing through the nose, transmuting any blockages or obscurations into streams of crystal clear higher mind control spreading through your entire nervous system. Spectral, electric blue and red Beta-Alpha vibrates subtle activating force into all etheric fibers. Descend back down central channel and leave Kali at the secret center chakra. Ascend back up central channel and return your consciousness to the fourth mental sphere, then close and seal the Heptad Gate at the top front of your skull. Relax and breathe slowly and deeply at least 13 times. Harmonic UR rune 95: Galactic Art Whole Becomes Meditation of Reality. For additional practice: Locate Heptad Gate 315 on the Hunab Ku 21. Note that it corresponds to the Prophet, the Renewer of Culture, World Teacher; S/P Mars, Bode Number 16.